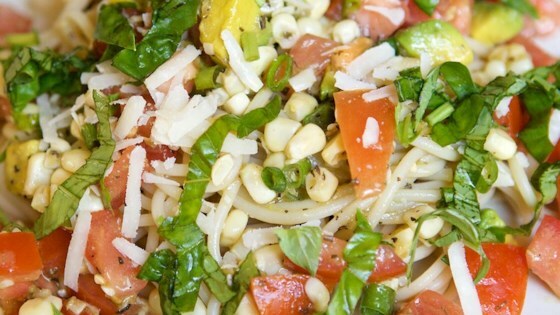 "This is a great summertime and end of summer pasta. It is a a great way to use all those garden tomatoes and fresh corn. It takes almost no time to prepare and tastes delicious! Feel free to use your favorite pasta. I use thin spaghetti." Very Very bland AND I added 3 times the amount of Basil! I will not make again! Really fast and tasty. My husband thinks to make it a 5 star recipe it should have bacon (and really EVERYTHING is improved with bacon). I added red pepper, garlic and zuchinni. It was truly delicious. I also used parmisan shredded cheese. Delicious and light summer dish. The parmasean makes all the difference, so use the "real" stuff! Very tasty recipe. Can be served hot or cold.